All clear bras are not the same. Keep in mind, film companies manufactures the film and third party companies actually design the patterns. This means a competitors clear bra may fit differently than our clear bra. Our patterns are designed for the novice installer in mind without compromising coverage. Even if you have a professional installer apply the film they will have a easier time installing it which means a cleaner looking end result. The installer is happy - you're happy. All of our kits are made on shiny clear coated film. There are some "sticker" companies selling kits but the film is not clear coated unless you pay 15-30% more than their listed retail price. What this means is after a few weeks the film will appear dull and will be much more noticeable on your car. 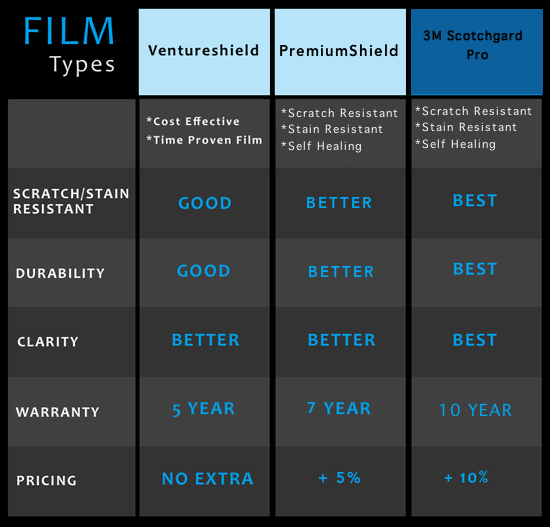 We recommend only films that are clear coated. Our patterns contain small relief cuts in areas that drastically help when installing but won't deter from the overall look when completely installed. See below for a comparison. These are both hood, fender, and mirrors kits for the same year and model car. Notice how the competitor design looks smaller? Well that's because it is. You are losing roughly 8 inches of film on the hood and the fender pieces are also smaller. If you are comparing prices then keep in mind that a cheaper kit (by possibly just a few dollars) could mean less film, less coverage, and your paint more vulnerable to those flying rocks we hate! Note: We can cut down any hood/fender kit if price is your main concern. On many models we offer smaller hood kits for those not interested in the industry standard 24" hood piece. Also, we do offer a price match guarantee which could give you an instant discount online. We send a free installation kit with each order that meets and exceeds $75.00. It takes more than just a squeegee to install a full pieces which is why we send a complete professional grade installation tool kit. We must be crazy!!! Ok, we understand this is considered a do-it-yourself product to most people that purchase from us. But this can mean a couple installation mishaps and mistakes and some of our customers want the perfect installation on their beloved ride. We get it. This is why we came up with a way for our customers to 're-do' the piece or kit at a fraction of the cost. It's pretty simple and this is how it works. When adding a product to your shopping cart for the first time you are asked if you want to add "installation insurance" to that product. There is a + 10% charge for this. After you successfully check out and pay for the item you have 90 days to use the insurance discount which means you can purchase the same product again but this time at 60% off. It is that simple! Note: No free special will be offered on the insurance item or any other coupons/discounts. There may be a company out there selling a cheaper paint protection kit and even use a brand name film. Remember, that kit may have less coverage, a poor fitting design, or a higher end price. Instead of trying to be the cheapest price (although we are very competitive) we offer a complete package along, great fitting patterns, and a great product overall. In the end, we feel you receive the highest quality product and a complete solution at an affordable price.